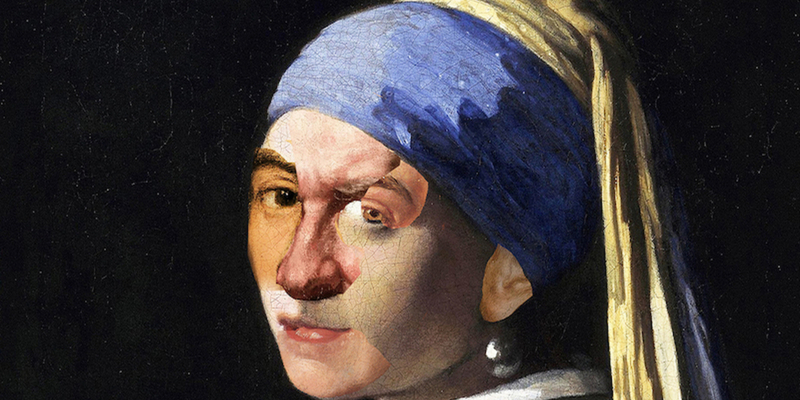 Artemis Potamianou, The Unknown Masterpiece Girl with a Pearl Earring, 2018, mixed media, 23 x 22 1/2". To enter “Your history, it’s not my story,” visitors pass through a towering black metal gate into a shadowy space, where Artemis Potamianou has arrayed elaborate birdcages. Inspired by those presented to Victorian brides on the eve of their weddings, and devised in the style of coveted bourgeois mansions, these structures house objects symbolic of the artist’s autobiography and a socially traditional female psyche (butterflies, figurines, Jane Eyre) in lieu of songbirds. The room bears a slight resemblance to Queen Anne’s chambers in Yorgos Lanthimos’s The Favourite (2018), where rabbits quartered in cages represent dead babies, women pimp themselves for tokens of power, and men in drag rule the country. The centerpiece of the whole installation, titled Which side are you on?, 2018, is a cabinet of curiosities displaying decapitated heads of classical statues exemplifying ideal beauty, which are enclosed in nets that nod to Man Ray’s bound Venuses. A motionless swing installed behind bars and bathed in the pink glow of a neon sign spelling the word “dream” suggests that protection is often another word for confinement. Elsewhere, for a suite called “The Unknown Masterpiece,” 2019, Potamianou has collaged fragments of facial features from portraits of powerful men over those of female sitters from recognizable old masters. Masculinity has disfigured them, like a skin graft gone bad. The stiltedness of the woman’s pose in Portrait of Doña Isabel de Porcel is stirred by a scream—more Francis Bacon than Francisco de Goya. Potamianou wallpapers this surreal art-historical theater with an elegant baroque pattern. Closer inspection reveals black silhouettes of iconic depictions of women by men, from Botticelli to Banksy. The male gaze has muted these figures, and the empty perches in the nearby birdcages become stages for songs too often unsung.